Popr Francis received a special version of the Huracan. VATICAN CITY -- Pope Francis received some hot new wheels in the form of a white-and-yellow Lamborghini but he won't be using it on the tree-shaded roads of the Vatican gardens. 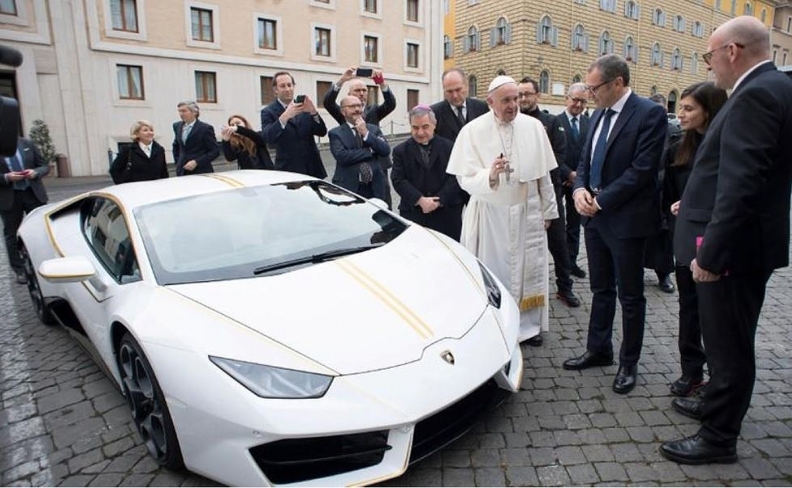 The donated Lamborghini Huracan, which normally sells for more than $200,000, was signed by the pope on Wednesday outside his Vatican residence and will be auctioned by Sotheby's, with proceeds given to the pontiff to help the needy. The Vatican said all the money would go to projects to help Christians return to rebuild their homes in Iraq's Nineveh Plains that were destroyed by Islamic State militants. They will also go to help female victims of human trafficking and forced prostitution and to two Italian groups which provide medical services in central Africa. Francis has shunned the papal limousines used by his predecessors in favor of a simple blue Ford Focus. White and yellow are the colors of the Vatican flag.